If you love walking into an immaculate house without taking the time or effort then Affordable Cleaning Crews is ready to help with all the Housekeeping chores. We cover a wide range of Housekeeping chores to free up your time so you can do the important things in life such as family, friends, and hobbies. Affordable Cleaning Crews uses Whip an earth friendly miracle cleaner that is safe for children and pets, We are committed to make your home, office and mobile home sparkle. 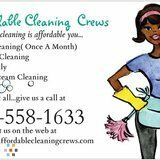 CALL TODAY FOR OUR DEEP CLEANING SERVICE PACKAGE.